CalilyTM Tower Ultrasonic Essential Oil Diffuser Aromatherapy Just $19.95! Down From $79.99! You are here: Home / Great Deals / CalilyTM Tower Ultrasonic Essential Oil Diffuser Aromatherapy Just $19.95! Down From $79.99! Sears has this CalilyTM Tower Ultrasonic Essential Oil Diffuser Aromatherapy on sale for $19.95 (Reg. $79.99)! SOOTHING & CALMING – The Calily Tower Aromatherapy Oil Diffuser emits a steady mist of soothing soft swirls, filling the air with your desired essential oil. The Calily Tower Oil Diffuser utilizes non-heat ultrasonic waves which does not compromise the flavor-impact compounds and the natural healing properties of the oils. Can also be used without oil as a humidifier. WHISPER QUIET OPERATION – Designed to be extremely quiet and pleasant; absolutely no noise, heat or vibration. Perfect for use at night and during the day. Great for bedrooms, bathrooms, massage rooms, spas, etc. Can be placed on your nightstand, on the desk in the office, etc. 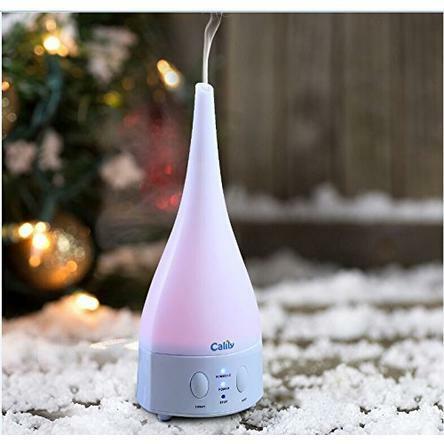 SAFE & EASY TO USE – The Calily Tower Aromatherapy Oil Diffuser is cool to the touch and features an auto shut-off switch for when the tank is empty. / Very easy to use; featuring a one-button-operation switch, just fill with warm tap water and add a few drops of your favorite essential oil. / LOW MAINTENANCE: No need for filters or distilled water. RELAXING & THERAPEUTIC MOOD ENHANCING LED LIGHT – Features 6 soothing mood enhancing colors; calmly and softly changing from one color to the next; adding an inspiring and mesmerizing inner calmness.